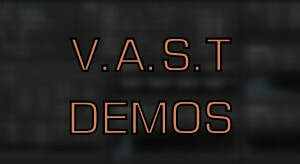 You will find in this section some audios extracts showing the potential of the V.A.S.T. synthesis from Kurzweil. These demos can be some custom sound design i made for some customers or the results of personnal tests, this synthesis is the right tool for deep sound mangling ! The story says it was played on a 8 voices NED Synclavier, exhausting the polyphony and making a monophonic sound. The challenge was the replicate the PWM Crossmodulation parameter. The ELKA Synthex once again ! This one was a custom sound design for a customer on a PC3Le. The project was about reproducing the sounds and making the different sequences that can be switched ON / OFF. You can play live the solo part. I made this brassy sound which is the typical signature of the Yamaha GX-1. With the V4.0, the Kurzweil Forte will have a new 6 operators fm engine, this is a demo of this new functionnality. The MatrixBrute is a great and very versatile instrument, you can have a wide range of sounds, from classic vintage to totally contemporary. Is a new star born ? ​​I had a synthesizers.com modular system a few time ago and i made this track just before selling it. I must admit that i miss its wicked and raw sound. This demo is a kind of tribute where all sounds are coming from the Dotcom except the drums and the choir that are coming from the Kurzweil PC3K. ​Using mostly some Kore64 sounds, raw or slightly modified. One track with voice + tambourine + acoustic strums from the original mix, everything else from the PC3K with Kore64 (bass, drums, arpeggios, piano, organ, guitar solo). Recorded in audio, no MIDI. I liked this synth !